BETTER TOGETHER: The Government has urged Scots to vote "no" in today's referendum on Scottish independence. BETTER TOGETHER: The Government has urged Scots to vote “no” in today’s referendum on Scottish independence. Bradford, KR, Sep 18 · Hur 3 – As Scotland goes to the polls to decide its fate in today’s independence referendum, the Government has formally come out on the No side, asking Scots to retain the union it has been part of for over three centuries. More than 4.2 million Scots have begun making their way to polling booths across the nation this evening to decide if Scotland will end its 307-year union with England that began in 1707. Polls have put the No vote only narrowly ahead of Yes, with No ahead at between 51 and 53 per cent. Despite the lead, the vote is anything but certain, with some nine per cent of voters still unsure as to which way they will cast their ballot. The results of the referendum will begin to arrive from mid-morning Eastern time tomorrow. If Scotland votes Yes, the clock will begin ticking for independence in March 2016. If No, the three main political parties in Britain have promised increased devolution to hand more power to the Scottish parliament. The referendum has nearly torn Scotland asunder, with heated debates nearly turning violent in some places. The Yes campaign in particular has been accused of dirty tactics, with Union supporters suffering increasing harassment as the campaign has progressed. Scotland is not the only place where the independence issue has stirred debate. Within the MicroWiki community, sides have appeared with several nations and politicians making their stance clear. James von Puchow, Sebastian Linden, and Ciprian I, heads of Landashir, Rudno, and Juclandia, respectively, have all come out in favour of Scottish independence, with von Puchow and Linden having been especially vocal for some months. All three claim that Scotland will be better off after independence, and that the British government at Westminster has proven itself too disinterested in Scotland to be worth retaining. St.Charlian President Alexander Reinhardt, while officially toeing his government’s line of official neutrality, has taken a dim view of Scottish independence, and has quietly put his backing behind a continuation of the union. This puts him personally at odds with his Prime Minister, Alex Specter, who is a strong supporter of Scottish independence and who has said that given the chance, he would vote Yes. Similarly in Austenasia, Emperor Jonathan, while not able to make judgment in his official capacity, has said to the Times that he is personally against independence. 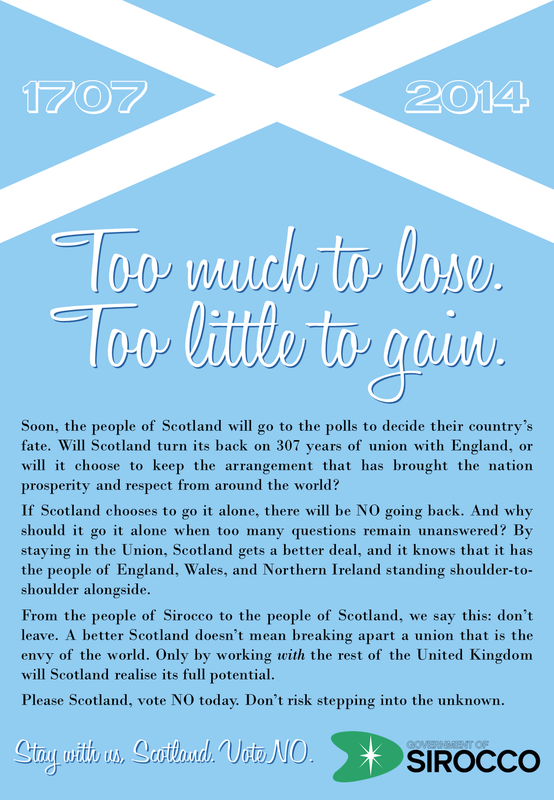 It seems contradictory for small nation-liking groups calling for Scotland to remain part of a larger nation state.